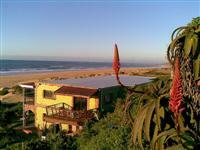 A short drive to the west of Port Elizabeth is the surfing paradise of Jeffrey's Bay, known colloquially as J-Bay. This determinedly laid-back seaside town is most famous for Supertubes, one of the best right hand point breaks in the world, considered South Africa's perfect wave. The town lives and breathes surfing and has several glorious surf spots which are gentler and more accommodating than the celebrated Supertubes. The waters of J-Bay are also frequented by dolphins, seals, and whales, and surfers are often lucky enough to mingle with these sea creatures. J-Bay is swamped by surf stores and the factory outlets selling cheap, branded clothes, and surf gear will delight surfers and shoppers alike. The long stretches of sandy beach around the town are picturesque and are renowned for their shells and the bright orange of their aloes, and the town is bordered on both sides by nature reserves and rivers. The region has a wide range of accommodation, including luxury game farms just out of town and cheap backpackers for budget travellers. The town itself is not particularly attractive but the natural setting more than compensates. Although J-Bay is a famously friendly place, surfers should note that localism can be a problem in the water. Be friendly and respectful with local surfers and be sure to abide by proper surfing etiquette.